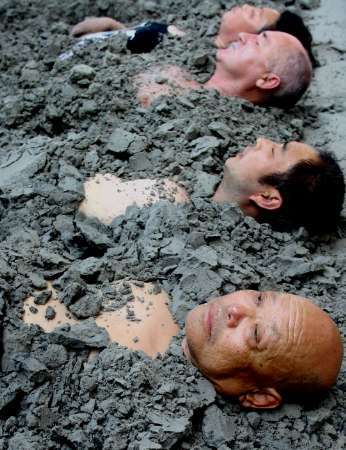 People enjoy mud therapy at a nursing home in Anshan, east China's Liaoning province August 21, 2006. The mineral mud is believed to be able to alleviate pain from rheumatoid arthritis, sequela of traumatisms and peripheral nervous system diseases. Picture taken August 21, 2006. I don't know about you, but I don't trust these Reuters captions! Tell us what you think it should really say. Entries will remain open until 11:59 PM, Central Standard Time, Tuesday, August 29. Submit your captions in the comments section, or email at mccracken.ken@gmail.com. Now you know what happens if you don't seek immediate medical attention after 4 hours. Captioning may well be the most important thing you do all day. Enter today! Okay. Tell your God to get you out of this one! The Chinese government unveild its plans today to use some of its elderly population to help fill potholes. The road to hell is not paved with relaxed men. Knowing the viscosity of the mud, Thao was fairly sure his bubbles would never make it to the surface. "Additional victims of Israeli aggression are shown in this photo, thoughtfully provided by Hezbollah." "Chinese alleviate pain from sequela of traumatisms caused by tequila." "Water pollution in China has reached epidemic levels. The five men pitcured here were trapped when the lake they were swimming in suddenly solidified around them..."
A recipe from the Idi Amin cookbook. Tired of accusations of putting their collective heads in the sand, members of the United Nations Security Council show that burrowing in mud can also keep them from having to face Iran's Nuclear ambitions. In an attempt to add credibility to his conduct in the Vietnam Senate Hearings, John Kerry hires Hezbollah's PR Firm to produce evidence of the alleged atrocities. "Is that...no...wait... I think there might be a worm in my shorts..."
Chinese tourists visiting a seaside resort just south of Beirut were asked by a man wearing a green helmet to pose for a local al Reuters photographer. Democrats launch a dig up the vote drive. The folks in Boston stoically took the news in stride that even more repairs would be needed to the Big Dig tunnel system. As Short Round slowly accepted the reality that he would soon die in the Poison Pits of Liaoning, he found some degree of comfort in the memories of his wondrous childhood adventures with the legendary Indiana Jones. "This Will Be The Last Time We Complain About Pot Holes."